Customer Appreciation Day with the Choke Cherry Tree!! 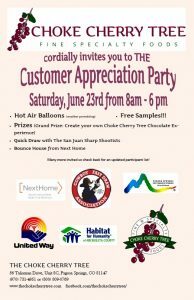 We will be teaming with our neighbor, The Choke Cherry Tree, for a Customer Appreciation Day on June 23, 2018 from 8am-6pm. We’re donating our bouncy house to the lawn party, while The Choke Cherry Tree will be offering free samples and prizes! Hot air balloons and a Quick Draw with the San Juan Sharp Shooters will also be going on. Stop by our office from 10am to 2pm for snacks… Premier Giveaways to anyone wanting to discuss buying, selling or renting out their homes! Or call ahead to make an appointment after hours (970)507-8655.